Microsoft Edge is undoubtedly the best and the fastest web browser from Microsoft. It has been well received by users and critics alike, performance wise its stable and on par with other renowned web browsers like Chrome, Firefox, Opera and Puffin. However, recently some users have complaints about Microsoft Edge not Closing error on Windows 7, Windows 10, Windows 8/8.1 PCs. This could be a very annoying error if not taken care of early on. When the Edge Browser on Windows PC is infected by this error, it freezes the web browser which refuses to close down despite you pressing the close button repeatedly. You may hit close button numerous times but the message saying ‘Are you sure you want to leave this page?’ keeps surfacing and even when you click ‘leave this page’ it doesn’t close the browser or leave the page. Edge browser might very well be working absolutely find in all other respects except this error. So, here you can see how to fix Microsoft Edge not Closing Error on PC and remove this problem forever from the Edge browser. 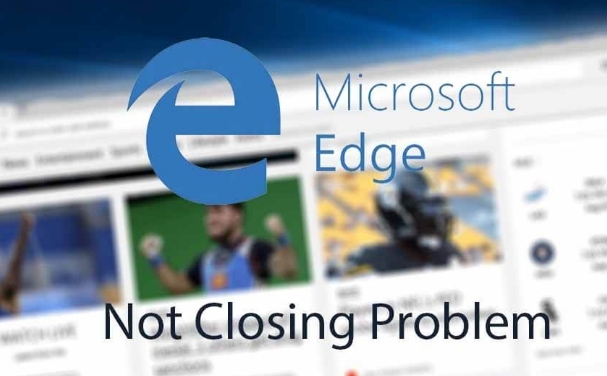 Microsoft’s web browser have been known to experience this ‘not closing’ error in the past, but the situation got a lot better with the Edge browser, that was only until Windows 10 Anniversary update after which many more users started encountering this Edge Browser Not Closing problem. In the Anniversary update Browser extension support has been introduced for the first time allowing users to install third-party extensions, which may be behind this error. Some webpages are virus infected, are full of javescript, incomplete codes and iframes. When you visit such websites on Edge browser or any other browser for that matter, errors are likely to appear soon afterwards. Here are a few simple tricks that you may apply at first to see if they fix the error on Edge browser. If they don’t work then move on to the solution tutorial below for more fixes. Edge browser not closing down problem may take the form of entire browser getting stuck making everything unresponsive or Edge browser is working fine except the close button. Try to close all open tabs one after the other on Edge browser and then close the Browser window. This should fix the problem. Or, right-click on Windows taskbar and select ‘Task Manager’ option from the list. Locate Microsoft Edge from the list of Running Process under ‘Processes Tab’, select Microsoft Edge and click the End button. If that didn’t fix the problem, then see this fix below. This second trick is a bit more technically advanced to close Edge browser if it gets stuck due to unresponsive close button or leave page option. Click on the tab that is not closing or preventing the browser from closing. Now, either go to Options menu on Edge browser settings and select F12 Developer Tools or press F12 Key to open the option. Click on the iFrame option and delete element. Tricks above should work if the problems is occasional. But frequent repeated occurrences means that the issue is sever and needs immediate remedial action to permanently root out the Edge Browser getting stuck error. Here are some of the main solutions that you can try to address Edge browser not closing issue. On Edge Browser, click on the three dots options menu icon on the top-right corner of the window and select New inPrivate Window option. This will take you to the new window for private surfing. If everything works find on private window then click again on the Options menu and this time click on Extensions option. Now, turn off all extensions one by one or all third-party extensions to see if that fixed browser not closing issue. Close edge browser window and open it again. This should work, if not, then see the next fix. Open Options Menu on Edge browser by clicking on the three dots button in the top right corner of browser window. Click Settings and then Choose what to clear. Check all options and click Clear button to remove browsing data. Now try to force close the Edge browser from the task manager or close it normally by clicking on the x button and open the browser again. Microsoft is default built-in app that is linked with system files, so if the system files are corrupt this could impact the performance of Edge browser. Therefore, repair corrupt system files to see if that bring the Edge browser back to normal. Read How to repair corrupt system files on PC Windows and then open Edge browser again. This should solve the problem. That’s all. You successfully fixed Edge Browser not closing error on Windows PC. For more help, leave feedback in the comments section below.